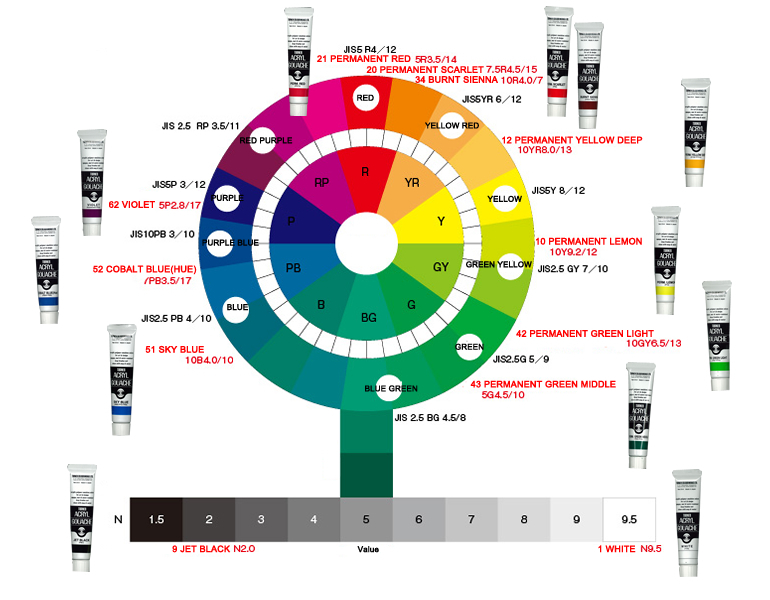 Since colour specifications by the Munsell Notation System are printed on Acryl Gouache, you can mix colours or arrange colour schemes logically and effectively without depending on experience or intuition. All the colours of Acryl Gouache can be mixed each other. In order to maintain brilliance of colours, colours near in hue should be mixed: for example, when you want yellowish red, you should mix red with orange instead of mixing red with yellow. On the other hand, when you want dull colours, colours far in hue or achromatic colours, i.e., white, black or gray are appropriate to decrease brilliance of colours. Burnt Sienna is sometimes used as a basic colour for colour mixing but as Burnt Sienna of Acryl Gouache has a high tinting strength, you should mix it with other colours gradually and carefully in order to obtain the colour you need.